The cable reels ensures safety and a perfect function. Thanks to their robust design, they can be used for a wide range of applications for the maintenance of electrical equipment in explosive gas atmosphere. The explosion proof cable reels are made of a conductive EPDM. The spoil for the cable is designed to store and form the explosion proof flange connections, together with a welded stainless steel housing, the connection compartment forms the type of security «increased safety e». Connection is made to the Ex-e connections of the flange connections. The CR17 standard model has a 16A flange connection. 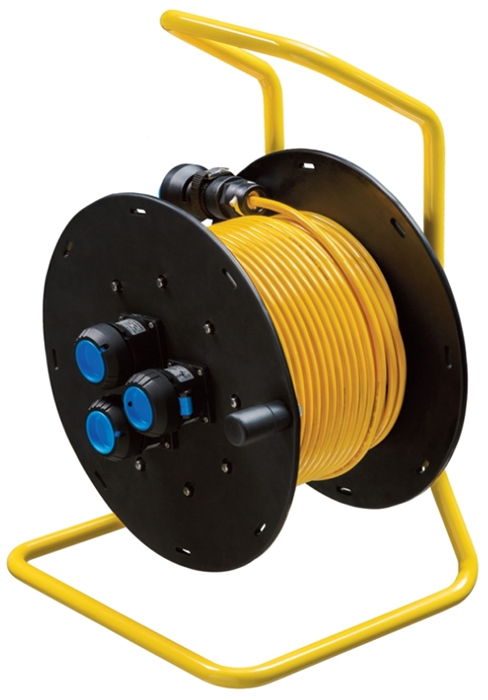 The CR 27 cable reel can be equipped up to 3 16A flange connections or a 32 A flange connection. Only cables (minimum requirement H07) approved for unprotected installation according to national standards may be used. The reels must not be used in explosive dust environments. In areas containing explosive dust environments, dust may not enter in the flange connection when the plug is removed. For this reason, Article 5.13 of IEC 60079-14 stipulates that the flange connections must be installed at an angle not perpendicular to 60 ° and the openings must point downwards.